Not to be confused with St Mary-le-Bow. Marylebone (/ˈmærɪləbən/ or /ˈmærələbən/,/ˈmærɪbən/, /ˈmɑːrlɪbən/, or /ˈmærɪlɪboʊn/[unreliable source?]) is an area in the West End of London, England, which is part of the City of Westminster. Marylebone gets its name from a church dedicated to St Mary, represented now by St Marylebone Parish Church (1817); the original church was built on the bank of a small stream or "bourne", called the Tybourne or Tyburn. This stream rose further north in what is now Swiss Cottage, eventually running along what is now Marylebone Lane, which preserves its curve within the grid pattern. The church and the surrounding area later became known as St Mary at the Bourne, afterwards corrupted to Marybourne, Marybone, Mary-la-bonne (French was the language of the aristocracy at the time), and now Marylebone. The received pronunciation is 'MARRY-le-bn', however 'MAR—le-bone’ is commonly used. It is a common misunderstanding that the name is a corruption of Marie la Bonne (French for "Mary the good"). The manor of Tyburn is mentioned in the Domesday Book (1086) as a possession of Barking Abbey valued at 52 shillings, with a population no greater than 50. Early in the 13th century it was held by Robert de Vere, 3rd Earl of Oxford. At the end of the 15th century Thomas Hobson bought up the greater part of the manor; in 1544 his son Thomas exchanged it with Henry VIII, who enclosed the northern part of the manor as a deer park, the distant origin of Regent's Park. Tyburn manor remained with the Crown until the southern part was sold in 1611 by James I, who retained the deer park, to Edward Forest, who had held it as a fixed rental under Elizabeth I. Forest's manor of Marylebone then passed by marriage to the Austen family. The deer park, Marylebone Park Fields, was let out in small holdings for hay and dairy produce. A map showing the wards of St Marylebone Metropolitan Borough as they appeared in 1916. In 1710, John Holles, Duke of Newcastle, purchased the manor for £17,500, and his daughter and heir, Lady Henrietta Cavendish Holles, by her marriage to Edward Harley, Earl of Oxford, passed it into the family of the Earl of Oxford, one of whose titles was Lord Harley of Wigmore. She and the earl, realising the need for fashionable housing north of the Oxford Road (now Oxford St), commissioned the surveyor and builder John Prince to draw a master plan that set Cavendish Square in a rational grid system of streets. The Harley heiress Lady Margaret Cavendish Harley married William, 2nd Duke of Portland, and took the property, including Marylebone High Street, into the Bentinck family. Such place names in the neighbourhood as Cavendish Square and Portland Place reflect the Dukes of Portland landholdings and Georgian-era developments there. In 1879 the fifth Duke died without issue and the estate passed through the female line to his sister, Lucy Joan Bentinck, widow of the 6th Baron Howard de Walden. A large part of the area directly to the west was constructed by the Portman family and is known as the Portman Estate. Both estates have aristocratic antecedents and are still run by members of the aforementioned families. The Howard de Walden Estate owns, leases and manages the majority of the 92 acres (37 ha) of real estate in Marylebone which comprises the area from Marylebone High Street in the west to Robert Adam's Portland Place in the east and from Wigmore Street in the south to Marylebone Road in the north. In the 18th century the area was known for the raffish entertainments in Marylebone Gardens, the scene of bear-baiting and prize fights by members of both sexes, and for the duelling grounds in Marylebone Fields. The Crown repurchased the northern part of the estate in 1813. 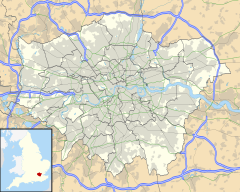 The Metropolitan Borough of St Marylebone was a metropolitan borough of the County of London between 1899 and 1965, after which, with the Metropolitan Borough of Paddington and the Metropolitan Borough of Westminster it was merged into the City of Westminster. Marylebone was the scene of the Balcombe Street siege in 1975, when Provisional Irish Republican Army terrorists held two people hostage for almost a week. For a list of street names' etymologies in this district, see Street names of Marylebone. Marylebone is characterised by major streets on a grid pattern such as Gloucester Place, Baker Street, Marylebone High Street, Wimpole Street, Harley Street and Portland Place, with smaller mews between the major streets. Mansfield Street is a short continuation of Chandos Street built by the Adam brothers in 1770, on a plot of ground which had been underwater. Most of its houses are fine buildings with exquisite interiors, which if put on the market now would have an expected price in excess of £10 million. It has attracted people who understand attractive buildings – at Number 13 lived religious architect John Loughborough Pearson who died in 1897, and designer of Castle Drogo and Delhi Sir Edwin Lutyens, who died in 1944. Immediately across the road at 61 New Cavendish Street lived Natural History Museum creator Alfred Waterhouse. Queen Anne Street is an elegant cross-street which unites the northern end of Chandos Street with Welbeck Street. The painter JMW Turner moved to 47 Queen Anne Street in 1812 from 64 Harley Street, now divided into numbers 22 and 23, and owned the house until his death in 1851. It was known as "Turner's Den", becoming damp, dilapidated, dusty, dirty, with dozens of Turner's works of art now in the National Gallery scattered throughout the house, walls covered in tack holes and a drawing room inhabited by cats with no tails. During the same period a few hundred yards to the east, Chandos House in Chandos Street was used as the Austro-Hungarian Embassy and residence of the fabulously extravagant Ambassador Prince Paul Anton III Esterhazy, seeing entertainment on a most lavish scale. The building is one of the finest surviving Adam houses in London, and now lets rooms. Marylebone is also home to the historical Nottingham Place. It is characterized by its ornate red buildings, leading up to Marylebone Road. Wimpole Street runs from Henrietta Place north to Devonshire Street, becoming Upper Wimpole en route – the latter where Arthur Conan Doyle opened his ophthalmic practice at number 2 in 1891. A six-floor Grade II 18th-century house at 57 Wimpole Street is where Paul McCartney resided from 1964–66, staying on the top floor of girlfriend Jane Asher's family home in a room overlooking Browning Mews in the back, and with John Lennon writing "I Want to Hold Your Hand" on a piano in the basement. At her father's house at number 50 lived for some time between 1840 and 1845, Elizabeth Barrett, then known as the author of a volume of poems, and who afterwards escaped and was better known as Elizabeth Barrett Browning. Today, at the bottom end of Wimpole at Wigmore can be found a sandwich shop named "Barrett's". Bentinck Street leaves Welbeck Street and touches the middle of winding Marylebone Lane. Charles Dickens lived at number 18 with his indebted father (on whom the character Wilkins Micawber was based) while working as a court reporter in the 1830s, and Edward Gibbon wrote much of The Decline and Fall of the Roman Empire while living at number 7 from the early 1770s. James Smithson wrote the will that led to the foundation of the Smithsonian Institution while living at number 9 in 1826, while number 10 was briefly graced by Chopin in 1848, who found his apartment too expensive and moved to Mayfair. More recently, Cambridge spies Anthony Blunt and Guy Burgess lived at 5 Bentinck Street during the Second World War. In 1960s two-some John Dunbar and TV repairman "Magic Alex" lived on the street, where the former introduced the latter to John Lennon in 1967. Manchester Square, west of Bentinck Street, has a central private garden with handsome plane trees, laid out in 1776. The mansion on the north side of the square, now the home of the Wallace Collection that features world-class French eighteenth-century painting, porcelains and furniture, once housed the Spanish ambassador, whose chapel was in Spanish Place. From the north-west corner is Manchester Street, final home of Georgian-era prophet Joanna Southcott, who died there in 1814, having attracted a jeering mob with report of a miraculous birth and prediction the Day of Judgement would arrive in the year 2004. Marylebone has some "Beatles" heritage, with a John Lennon flat at 34 Montagu Square, and the original Apple Corps headquarters at 95 Wigmore Street. Bulstrode Street, small and charming, is named after a Portman family estate in Buckinghamshire, itself named after a local family there made-good in Tudor days. Tucked away, with a few terraced houses, Bulstrode Street has been the home of minor health care professionals for hundreds of years. The RADA student and aspiring actress Vivien Leigh, aged twenty in 1933, gave birth at the Rahere Nursing Home, then at number 8, to her first child. The north end of Welbeck Street joins New Cavendish Street, the name of which changed from Upper Marylebone Street after World War I. Number 13 in New Cavendish Street, at its junction with Welbeck Street and on the corner of Marylebone Street, was the birthplace in 1882 of the orchestral conductor Leopold Stokowski, the son of a Polish cabinet maker. He sang as a boy in the choir of St Marylebone Church. At the northern end of Marylebone High Street towards the Marylebone Road there is an area with a colourful history, which includes the former Marylebone Gardens, whose entertainments including bare-knuckle fighting, a cemetery, a workhouse, and the areas frequented by Charles Wesley, all shut down by the close of the 18th century, where today there are mansion blocks and upper-end retail. At No. 1 Dorset Street resided mid-Victorian scientist Charles Babbage, inventor of the analytical engine. Babbage complained that two adjacent hackney-coach stands in Paddington Street ruined the neighbourhood, leading to the establishment of coffee and beer shops, and furthermore, the character of the new population could be inferred from the taste they exhibited for the noisiest and most discordant music. A venue for chamber music, the Wigmore Hall, opened at 36 Wigmore Street in 1901. It hosts over 400 events each year. Marylebone was formerly a part of the Metropolitan Borough of St Marylebone, and the St Marylebone UK Parliament constituency (1918–1983). St. George's Hall, a theatre built in 1867, demolished 1966. Yorkshire Stingo, a public house on Marylebone Road. St Marylebone Grammar School on the corner of Lisson Grove and Marylebone Road, now offices. Theatre Royal, Marylebone, a former music hall opened in 1832 at 71 Church Street, demolished in 1959. The area is served by routes 2, 13, 18, 27, 30, 74, 113, 139, 189, 205, 274, 453 and night routes N18 and N74. For education in Marylebone, see List of schools in the City of Westminster. Regent's College, whose campus is within the grounds of Regent's Park, which houses:European Business School London; British American College London; Regent's Business School; School of Psychotherapy and Counselling; Webster Graduate School; Internexus, a provider of English language courses. ^ "Rail announcements". Archived from the original on 31 October 2015. ^ A broader definition designates the historic area as Marylebone Village and encompasses neighbouring Regent's Park, Baker Street and the area immediately north of Marylebone Road, containing Marylebone Station, the original site of the Marylebone Cricket Club at Dorset Square, and the neighbourhood known as Lisson Grove as far as the border with St John's Wood. 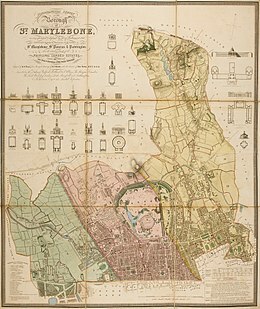 ^ "History of St Marylebone, in Westminster and Middlesex – Map and description". visionofbritain.org.uk. Archived from the original on 17 September 2013. Retrieved 15 October 2013. ^ "Maryburne rill", in Harrison's Description of England 1586, noted by Henry Benjamin Wheatley and Peter Cunningham, London Past and Present: its history, associations, and traditions, Volume 2, p. 509. ^ Smith, Thomas (1833). A Topographical and Historical Account of the Parish of St. Mary-le-Bone. London: John Smith. p. 3. ^ Wheatley and Cunningham, p. 509. ^ Wheatley and Cunningham; they note the annual rents brought in £900. ^ Wheatley and Cunningham, p. 511. ^ "LUTYENS, Sir Edwin Landseer (1869-1944) & PEARSON, John Loughborough (1817-1897) English Heritage". www.english-heritage.org.uk. Archived from the original on 10 April 2016. Retrieved 27 March 2016. ^ "WATERHOUSE, Alfred (1830-1905) English Heritage". www.english-heritage.org.uk. Archived from the original on 10 April 2016. Retrieved 27 March 2016. ^ Gayford, Martin. "JMW Turner: the man behind the masterpieces". The Daily Telegraph. Archived from the original on 21 October 2017. Retrieved 5 April 2018. ^ "Austrian Foreign Ministry -> Embassy -> London -> History of the Austrian Embassy". www.bmeia.gv.at. Archived from the original on 15 December 2012. Retrieved 27 March 2016. ^ Lownie, Andrew (2015). Stalin's Englishman: The Lives of Guy Burgess. London: Hodder and Stoughton. pp. 114–115. Wikimedia Commons has media related to Marylebone. Wikisource has the text of the 1905 New International Encyclopedia article Marylebone. Chisholm, Hugh, ed. (1911). "St Marylebone" . Encyclopædia Britannica. 24 (11th ed.). Cambridge University Press. p. 30. Marylebone Association[permanent dead link]. The amenities society for Marylebone representing its residents, businesses and people who live and/or work in Marylebone The Association's area is bounded by Oxford Street (South), Edgware Road (West), Marylebone Road (North) and Great Portland Street (East).